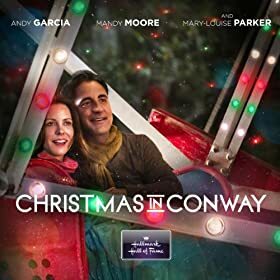 Christmas In Conway - Information about the Hallmark Hall Of Fame Christmas In Conway and the Ferris Wheel used in it. "Christmas in Conway" official ABC® trailer :30 Sec. CHRISTMAS IN CONWAY official ABC® trailer :15 Sec. All-star cast: Mary-Louise Parker, Andy Garcia, Mandy Moore, Cheri Oteri, Riley Smith. Premieres Sunday December 1, 2013 on ABC®! Duncan turns up the water pressure, blows the sprinklers! Cedar Rapids Native Actor Riley Smith (Tommy) take a walk with Mandy Moore (Natalie), it's her birthday!